Developer Bob Rolader, at the podium, makes the case for a single-family subdivision proposal at Ga. Highway 92 in south Fayetteville. Photo/Ben Nelms. 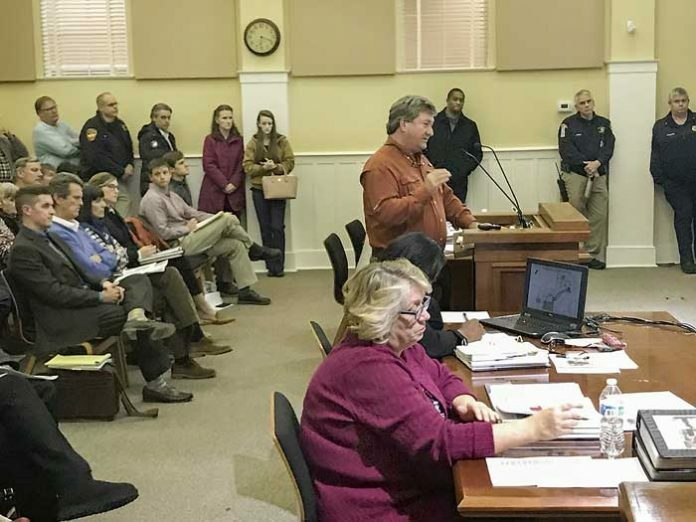 The Fayetteville Planning and Zoning Commission on Jan. 17 voted unanimously to recommend rezonings and an annexation that could result in the development of a 145-single-family home subdivision on the city’s south side. The 67-acre property is bordered by Ga. Highway 92 and the Ga. Highway 92 Connector. Representing Fayette Ventures, longtime Fayette resident and developer Bob Rolader requested that 37 acres be rezoned from C3 (highway commercial) to R-THC (residential townhouse condominium) and 29.61 acres be annexed and rezoned from R-40 (single-family residential) to R-THC. Both Rolader and the commission noted that the property will be developed for 145 single-family homes with a minimum of 1,800 sq. ft.
“This is not an affordable housing neighborhood,” Rolader told commissioners. Rolader said the 67-acre property will carry a density of 2.17 units per acre. Lots are planned to range from 50-75 feet in width and 120 feet in depth. The subdivision will include an amenity center, 13.8 acres of greenspace, lake access and sidewalks. Approximately a dozen conditions accompanied the unanimous recommendation for approval by commissioners. Among those were no egress to the neighboring Kingswood Estates subdivision, the use of carriage-style garage doors and minimum 1,800 sq. ft. home. A small group of neighbors spoke in public comments. They described the expected increase in traffic congestion and a potential on their home values. The annexation and rezoning request will be heard by the Fayetteville City Council on Feb. 7 and 21. The original proposed concept plan, reviewed by the Planning and Zoning Commission for the first time in July 2016, included 192 single family detached and 78 townhouses over the entire 98-acre site. Approximately 39 single-family detached homes would be located on the additional 19.94 acre parcel to be considered for annexation. Ingress and egress for the residential community were proposed via two entrances on the Highway 92 Connector. The revised concept plan was submitted in January 2017. The concept plan included 203 residential lots, instead of 233 as were shown on the previous concept plan. Only single-family detached homes were planned (no townhouses) and a 1.2 acre commercial lot and an 8-acre self storage facility had been added to the concept plan. In February of 2017, the applicant asked that the application be tabled until there was a ruling on the South Side Master Plan lawsuit between the property owners. After a ruling on the case, the applicant requested to again be placed on the Planning and Zoning Commission agenda. The result of the court decision rendered the South Side Master Plan null and void.